可算名詞 【植物, 植物学】 カーネーション (⇒Mother's Day 【解説】). He was wearing a carnation in his buttonhole. 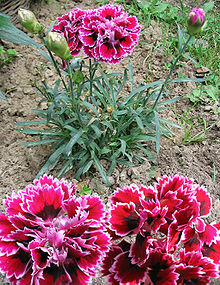 From Middle French carnation (“person's color または complexion”). (botany) A type of Eurasian plant widely cultivated for its flowers. And the women of New Bedford, they bloom like their own red roses. But roses only bloom in summer; whereas the fine carnation of their cheeks is perennial as sunlight in the seventh heavens. Of a rosy pink or red colour. (archaic) Of a human flesh color.